Some people are moving out of the mainstream, giving up most of their positions, and living in a van, school bus, or converted vehicle. This is actually becoming a very popular “trending” lifestyle. In fact, there are many well known “Youtubers” who have accumulated quite the following doing the van thing. You can find it all on Youtube. There are people showing how they do it, how to do it, and offering a “day-in-the-life” or a “slice-o-life” living life in a van. One day at my job I was talking with a co-worker when she mentioned she has a friend who travels and lives in her van. I was immediately captivated as this has been something I wanted to do for quite some time. About a year ago I asked my mother what she wanted to do with her life now that she is 70 years-old? She said, “I want to be a gypsy! Can we just buy a big van and spend all out time traveling.” my mother’s answer surprised me a bit and It is an option I often consider. As I spoke more and more with my co-worker I decided the best thing to do was interview this young traveler. I wanted to get her story… This is a story telling podcast after all! And she has a cool story. On her Youtube page she shares with the world her style and techniques of how to live in a van. Episode OHS059 is my first podcast interview with Curious Karli! 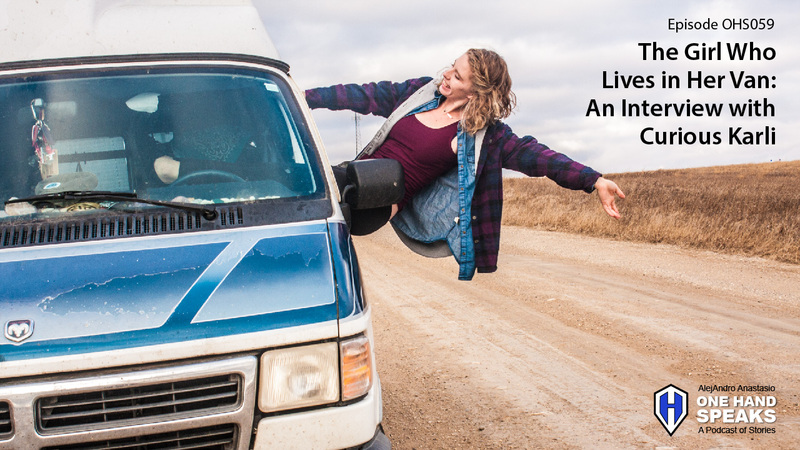 Curious Karli is just a young woman who lives in her van and travels as much as possible. My first One Hand Speaks interview. Interview Video Clip – See a bit of this podcast interview as a video. Youtube – Follow Curious Karli on Youtube. Facebook – The FB page of Curious Karli. Instagram – Here is Curious Karli’s Instagram page. Man, thanks for your reply and feedback. I will work on my skills. Please check my links to get more info about her.